My name is Karen, I’m 56 years old and I my got first lesion when I was 15 on my groin. I’ve been dealing with this disease almost my entire life, or least it feels like it. Like many others I sought care and was misdiagnosed. Doctors would pinch, poke and cut me on their table. I endured pain while I was awake no one ever should. I passed out a few times and woke in a pool of sweat. Needless to say, it only took me two visits to learn not to go back to those doctors again. Other than my parents, husband, and sisters, no one knew the truth of what I was dealing with. If I was committed and HS struck, I always had the flu. When I finally decided to talk it was with immediate family members and very difficult to explain, especially when I didn’t totally understand exactly what I was dealing with myself. Years passed when I was finally diagnosed with a name: Hidradenitis Suppurativa. By this time, I had been diagnosed with diabetes type 2, thyroid disease, auto immune disease and anemia. I sought care and help everywhere I could. I had seen several physicians for answers. Even though it finally had a name doctors and nurses still never heard of it and had NO CLUE what it was. Fast forward to today. I’m in stage 3, I have been through multiple major surgeries, 48 just the ones I have records for, and skin grafts. My latest skin graft was August 2018. My doctor said I don’t have much skin left. I’ve been on many rounds of antibiotics, ointments, soaps, creams, bleach baths, sweat glands removed and still my body attacks me. In 2017 & 18 I went on Humira®, but I was not a good candidate. After two months I ended up in the hospital both times with severe infections, sent home with a PICC line and visiting nurse. I’m currently receiving Infliximab infusions (previously used for breast cancer patients) which works against tumor necrosis factor. I’m really hoping for positive results, maybe remission for the first time in years. Still too early to tell. wound vacs. My husband never stops giving his time, love, affection, or uplifting words like how beautiful I look even when I don’t. I’m so grateful. I’ve truly been blessed. My love for photography and art started many years ago after when all I could do is sit and heal. I find inner peace painting, coloring and in Photography. It helps with my pain, thoughts and emotions. I call it moment mindfulness. My form of meditation. I don’t focus on the end result, it’s what I experience right in the very moment when I’m experiencing it. I decided to enter “Peaceful Feeling” in the Rare Artist Contest though the advice of friend who was familiar with my piece. Several months of public voting, I was excited to see it came in first place in the Adult category. HS went to Capital Hill! My art “Peaceful Feeling” representing HS was on display. I was in Washington, DC, February 24-March 1. The Artist Reception was difficult: All I could think about was the throbbing in my groin. With photographers there the last thing I wanted was my picture taken, especially being on Steroids; my face looked like a pumpkin. The reception was very nice, and kind of overwhelming to see my piece of art blown up so large sitting on a pedestal as we walked in. My husband and mom attended the event with me. It was nice to see them so proud of me. My art will be displayed at Rare Disease events all year to represent HS. I met some of the kindest people that were sick themselves with different diseases. I met no one with HS. Which made me realize even more what a rare disease I have. I was presented award money on my HS Art piece “Peaceful Feeling” which I plan on donating the entire amount to better serve HS and its patients. I’m grateful to be given this experience, I will never forget it. I think the most difficult part of this disease for me has been acceptance; accepting the new me. I’ve always been very active and could do the work of five men. Through the years and surgeries, that has slowly been taken away from me. I can’t squat or bend like I used to prior to my skin grafts, I can’t walk long distances without hurting and certainly don’t drive tractors or work like a man anymore. I have to take my cushion every where I go and I have one in both vehicles, because if I don’t, I suffer. I never totally commit because next month I may be sick with a lesion. My immune system is always run down, even more now due to the infusions which gives me limited time with my grandbabies or anyone else with a runny nose. I’ve been in the plastic bubble many times. I thought I was always letting my family down and disappointing them. I went through a tremendous amount of guilt, still do. The ones I love the most. This made me angry. I think I went through the five stages of grief accepting my new normal, the new me. Today I wake up smiling; I’m so grateful to be here. I may never see my old self again, this is the new me. I’ll do what I can, when I can. I continue to get lesions on this horrible roller coaster and ask God to just make it stop. I can’t sit for long periods, take comfortable plane rides or walk long distances, and I’m in pain every day, but I’m ALIVE. I believe a positive attitude is an essential part of healing. While living with HS for over forty years, Karen's happiest moments come from spending time with her husband Dean and their six children and twelve grandchildren. 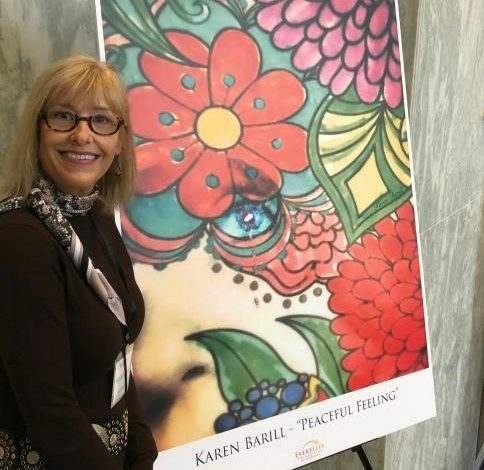 Karen channels her stength and motivation to help herself and others with HS by advocating when her health allows. She quotes, "May no person feel what I have felt, put it away forever." 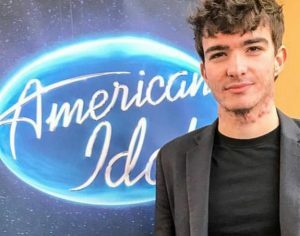 Will HS Warrior Jackson Gillies be the Next American Idol? Once we make the darkness conscious it may be easier to see the light, the good of being a human who just happens to have HS. I am sorry you have HS Karen, but in a nice way I am very glad you DO have HS. (Apart from having HS, we have something in common: I once sat on the back steps of Capitol Hill, just me and my HS on a sweltering uncomfortable day). Thank you so very much Karen, what you have done and continue to do is nothing short of amazing!